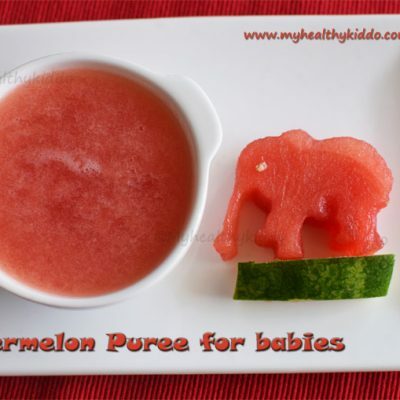 Watermelon puree for babies – Watermelon is an ideal choice for babies. The natural sweetness in watermelon will make it a favorite fruit for babies and kids. Some people still believe that watermelon is just a mixture of water and sugar !! In reality, watermelon is more healthier than you think ! It is a reservoir of vitamins, minerals and antioxidants that are good for eyes, heart and the whole immune system. Watermelon is actually recommended for cold, cough & fever ! Vitamin C and antioxidants present in watermelon, help to fight against the virus. For babies, watermelon is recommended from 8+ Months. When introducing for the first time, make the puree as directed in this post, strain them and give it as a juice. Check for rashes or any other allergies . Then start giving puree without straining(as per this post). If you see any rashes or discomforts, pls consult your Pediatrician. 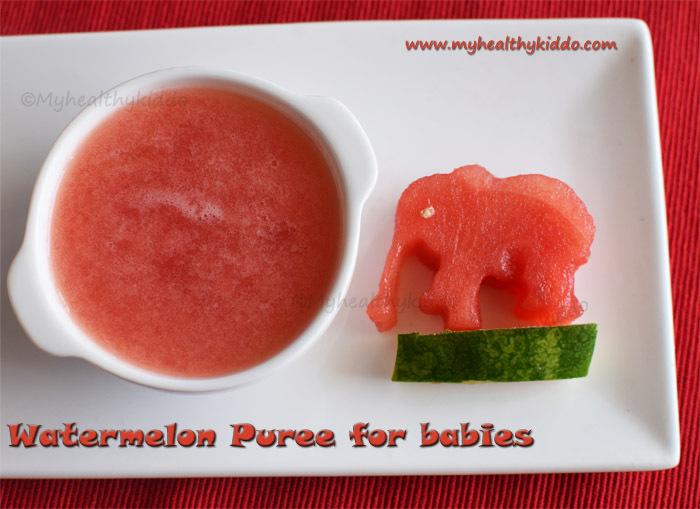 Pls click here for the collection of baby puree recipes..
Wash the watermelon before cutting. Cut out the required slice. Then cut out the fleshy part and slice them into pieces. Pulse the slices in mixie and make sure there are no lumps in it. Transfer to feeding bowl. 1.The white rind of the watermelon is also nutritious. While cutting out the fleshy part, try to include some white rind too. 2.If you are feeding it to babies who do not know to chew, be cautious that you grind smoothly without any lumps. Preparation – How to make watermelon puree for babies? 1.Wash the watermelon before cutting. Cut out the required slice. Then cut out the fleshy part and slice them into pieces. 2.Pulse the slices in mixie and make sure there are no lumps in it. Transfer to feeding bowl. Water melon puree is ready in a jiffy. Feed fresh immediately.. The white rind of the watermelon is also nutritious. While cutting out the fleshy part, try to include some white rind too. If you are feeding it to babies who do not know to chew, be cautious that you grind smoothly without any lumps.